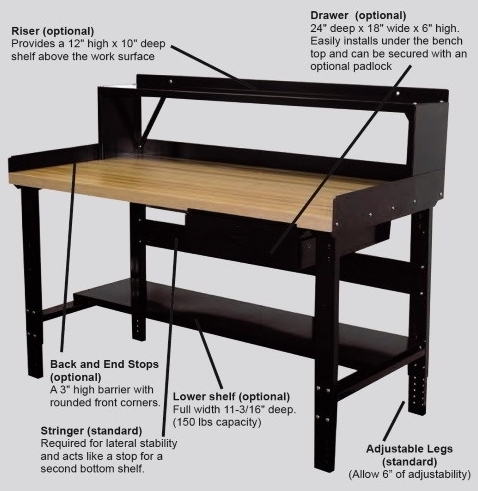 For extra work space that is durable and long-lasting, we now have quick ship industrial workbenches available with adjustable heights and optional storage drawers. 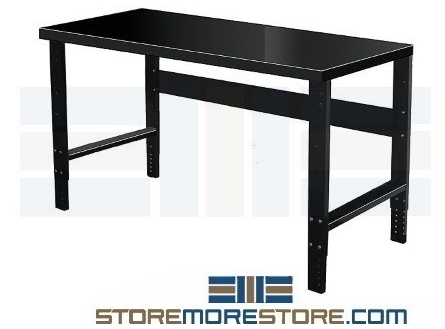 These workbenches are perfect for use in a wide variety of applications and harsh work environments, including industrial, electronics, labs, healthcare, repair shops, and more. They are available in several sizes with multiple options available so you can choose the work space that suits your exact needs. 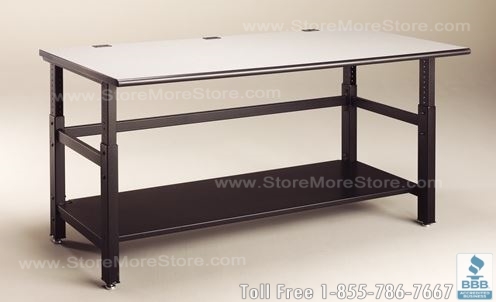 Industrial workbenches are available in your choice of three types of work surfaces. All surfaces support 200 lbs. per square foot when evenly distributed over the entire surface. Steel top: Heavy 12-gauge steel, 1¾” high, no holes on work surface. Will not crack, splinter, gouge, or absorb oil. Steel tops are strong, durable, and can withstand daily industrial use. This makes them great for applications such as welding and cutting. Steel tops are available in 48″W x 30″D, 60″W x 30″D, and 72″W x 30″D. 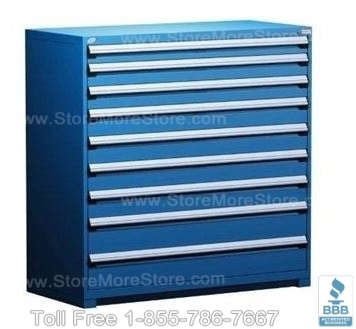 Shop top: 1¾” thick high-density particleboard. This particleboard is 30% harder than maple and offer superior screw holding characteristics. Shop tops are non conductive, making them ideal for electronics workstations. The top and bottom layers are sealed to resist conventional spills. Maple hardwood top: Constructed from kiln dried hardwood and face-glued for durability, attractiveness, and long-lasting use. The maple tops are available in 48″W x 30″D, 60″ W x 30″D, 72″W x 30″D, and 72″W x 36″D. Included with 6″ adjustable legs and stringers for lateral stability and stop for optional lower shelf. Drawers 18″W x 24″D x 6″ high that install under the work top. Includes padlock lug for locking. 3″ high steel rim and barrier stops to keep items from falling off the work surface. 12″H x 10″D metal shelf riser above work surface. 4″ swivel casters with brakes. 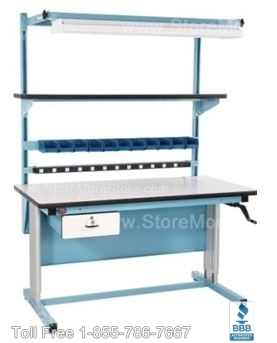 Industrial workbenches with adjustable heights and optional storage drawers are available to buy online. Benches ship quickly in 7-10 business days.